Combat Ready Clamp Goes Where A Tourniquet Cannot | OhGizmo! We’re pretty happy it’s becoming common knowledge that when someone is badly injured and bleeding severely, the best on-scene treatment while awaiting paramedics is the application of a tourniquet. If you don’t know, this is when you tie a piece of rope above the injury and tighten in order to cut off blood flow and prevent death from exsanguination (read: bleeding out). Sadly, it’s not always possible to apply a tourniquet in every situation: when injured in the groin, the abdomen or the neck for instance. 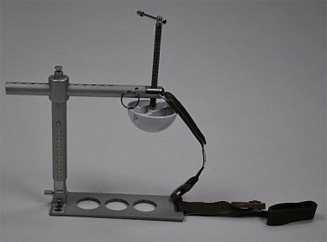 For times like these, Combat Medical Systems of Fayetteville, N.C. has developed the CRoC, or combat ready clamp, which is a vise-like device designed to manage difficult inguinal bleeds (that’s groin bleeds… Come to think of it, this is probably not a good idea on the neck…). 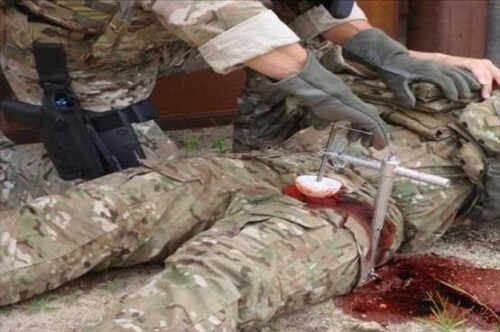 Uncontrolled bleeding accounts for 25% of potentially survivable deaths in the field and according to an article in the U.S. Army Medical Department Journal, getting better stemming the flow of blood in the field could save up to three soldier lives per month. While the CRoC is clearly aimed for the armed services’ use, you can apparently buy one for yourself for $445. Yeah that was the old thinking. It is completely wrong! Please update your knowledge. Internet knowledge is vastly different from real-world experience. Tourniquets are first line of defense for MASSIVE EXTREMITY BLEEDING. Most do not know or understand how to apply proper direct pressure. Thank God the military figured out this flawed thinking in civilian medicine years ago and changed their protocols. Your online dictionaries and civilian medical resources will be slow to change…they always are, but you will not lose an arm or a leg if you have a tourniquet applied for an hour or 2. Plenty of time to get the victim to proper medical care.